A lot of people do not realize it, but there are several small, simple things that we do in our everyday lives that trip us up financially and ding our credit score. We do some of these things without really thinking about the consequences. They may only reduce our credit score by ten or twenty points, but if you add them all up, then it could be a big hit. By avoiding these simple little debt pitfalls, you can keep your credit score shiny and new like which is what lenders want to see, of course. Making a conscious effort on the small money and credit tasks can make a big difference. 1. Exceeding Your Credit Limit – The quickest way to scuff up your credit score in one day is to exceed your credit limit. Not only will your credit score drop right away, but you will also get hit with a ton of extra charges and fees. 2. 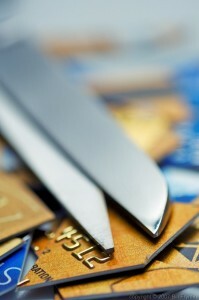 Closing Unused Credit Cards & Accounts – Closing accounts that you have had for a long time can hurt your credit score. A portion of your credit score is influenced by the length of time you have proven that you are a good customer and a good credit risk that pays back his or her debts on time. Closing an old account that shows how great a borrower you are reduces your credit history and decreases your credit score. 3. Maxing Out Your Credit Cards – Maxing out your credit cards increases your debt ratio. Even if you submit your payments on time, your credit score can remain in the low 600s. You should aim to reduce your credit card debt and keep your total debt balance below 25% of your total credit limit. 4. Applying For Store Credit – Applying for in-store credit or a store credit card can reduce your credit score by 20 points. I used to fall for this one in order to get the 10% discount on my first purchase. Not only does it ding your credit score, these store charge cards have high interest rates too. 5. Opening Too Many Accounts Too Soon – Acquiring several new credit card accounts within a short period of time looks very bad on your credit report. Not only are you opening new accounts, but you are also having those lenders pull your credit reports which hurts your score too. Not only could you potentially increase your debt load, but your new accounts will shorten the average age of existing credit accounts. Avoid Payday Lenders – Payday lenders and other quick finance company loans look bad on your credit report when a bank pulls your score when considering your loan application. By taking out loans from finance companies, you could lower your credit score by 30 points or more. Another reason to avoid them are their crazy high fees which can equal over 456% when annualized. Do not forget to keep an eye on your credit score. I love the services and use the ones offered by myFICO.com. Everyone knows that you can request one free credit report from the credit bureaus every year, but they will not give you your FICO credit score. You have to go to myFICO.com to get that. myFICO is the website run by the Fair Issac Corporation, the inventors of the FICO score. myFICO.com is the ONLY place where you can get your FICO scores, the scores that lenders use, from all three credit bureaus. The greatest way to see to this condition should be to talk to the credit card company openly and try to agree on a resolution or settlement method. By cooperating with the creditor, you are mounting your likelihood of settling this debt peacefully and forestalling having a low credit rating from the creditor.